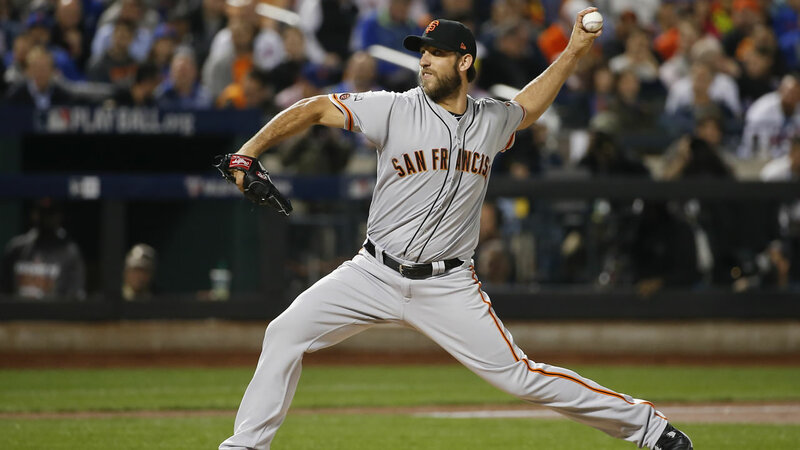 NEW YORK -- Nobody takes to October like Madison Bumgarner and the San Francisco Giants. With their ninth consecutive victory when facing postseason elimination, manager Bruce Bochy and the Giants advanced to face the NL Central champion Cubs in a best-of-five Division Series. Game 1 is Friday night at venerable Wrigley Field in Chicago. The good news for the Cubs as they attempt to end a championship drought that dates to 1908 is that Bumgarner probably won't start until Game 3 - and would only be available once on full rest. That's because the big left-hander has been untouchable under pressure. Including his four-hit shutout at Pittsburgh in the 2014 wild-card game, he has tossed 23 straight scoreless innings in winner-take-all games. Now, the Giants have a chance to extend their pattern of even-year championships after winning World Series crowns in 2010, '12 and '14. In a matchup between the past two NL champions, Syndergaard went seven innings. Brandon Crawford doubled leading off the ninth against Familia. Angel Pagan struck out after failing to get a bunt down, and Joe Panik walked. Gillaspie, starting at third base for injured All-Star Eduardo Nunez, drove a 1-1 pitch over the fence in right field and pumped his arm as he rounded first. Bumgarner closed with a 1-2-3 ninth against the 3-4-5 hitters and smacked his glove in triumph when rookie T.J. Rivera flied out to end it. Eager to take advantage of Syndergaard's slow delivery, Span stole second before Brandon Belt sent a long drive to deep center. Curtis Granderson, moved over from right field late in the season because of injuries to two other outfielders, crashed hard with his left shoulder into the padded fence 408 feet from home plate and tumbled to the warning track. He held onto the ball, however, and was shaken up a bit before getting to his feet and jogging off the field as teammates waited to high-five him and fans chanted "Grandy! Grandy!" Syndergaard raised his arm, while Belt tossed his helmet in frustration between first and second. Syndergaard struck out 10 in seven innings of two-hit ball and fired 42 pitches at least 98 mph - more than the Phillies (41) and Indians (35) threw all year, according to a tweet from Inside Edge. And while Syndergaard simply overpowered the Giants at times, Bumgarner kept the Mets off balance by mixing pinpoint pitches and changing speeds from around 93-77 mph. New York came out swinging after manager Terry Collins said before the game his hitters had seen enough video of Bumgarner over the past two days to know he would challenge them. But the aggressive approach played right into the hands of Bumgarner and the Giants, with a bullpen that struggled badly down the stretch. The big lefty was able to get quick outs early and easily went deep into the game. He needed only seven pitches to get through each of the first three innings, with the help of a double play. Still, he was visibly aggravated at times by Mike Winters' strike zone - so was Mets reliever Addison Reed, it appeared - and had a quick chat with the plate umpire between batters in the sixth.